Last week I saw this lamp at a thrift shop and immediately thought, wow, that’s kinda odd. Rarely do I see metal shades on lamps let alone shades or other random objects in this vivid golden yellow. It looked like something Peggy’s mom from “Madmen” might have in her house in Queens (okay, a friend of mine from Rego park in Queens corrected me and told me Peggy’s mother actually lives in Bay Ridge, Brooklyn). I doubt Don would have it his house, it seems too earthy or rustic (perhaps his daughter’s teacher would have it in her garage apt.?) and sometimes it’s hard to tell what’s tacky in a particular period– a very interesting concept in itself I find fascinating. This lamp strikes me as rustic cabin meets colonial maiden. I remember once reading somewhere that Victorian home decor and architecture–the garish colors and whimsical styles were of course inspired by Queen Victoria’s taste–meaning; she had little. Somehow the lamp reminded me of this–sort of cheap and clunky in one era, and strange and coy in another. It seemed from the ’40s but I couldn’t be sure. 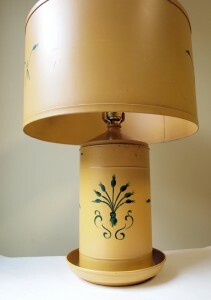 The bottom of the lamp read, “Designed by Franklin S. Bennett in California” I googled Franklin to little avail–yes he was a painter and I found out he did a stint in California in the late 30s, early ’40s but I couldn’t find any home decor he may have designed. So anyone out there that may know? Please send any info, I’d love to know, it’s a great lamp! And most likely I’ll sell it or perhaps it belongs beneath a set of deer antlers as it lights a game of Rummy. ry,this life time unforgettable proecjt would not hv happened without u.. you are really my lucky star (or vice versa too haha)! we did sthg a true suen-mei-ologist has been longing for.. those so called suen-mei-ologist hv to “sei hoi”~ haha! really too many unforgettable moments in this trip, e.g. sneaking into her room and taught her how to move with the gown, how to fix the gown, last min evaulation at the hotel lobby and of cuz watching the show under such a damn cold weather~i really couldnt hold my tears when I saw Yvonne coming in the hotel with her suitcase after the final.. too bad u were in the washroom otherwise we might hv made a scene haha~i do hope that we can work out some more meaningful proecjts in the further..wish u hv a gd trip to peru next yr!hugs!